We all want a cat who is friendly, sociable and wants to spend time with us. The time for socialising your kitten is in the first two months of his life, this will help shape your cat's personality for the future. Making sure he experiences as much of the 'real world' as possible is of utmost importance. In cats, shyness and boldness are, to some extent inherited; shy mothers and fathers tend to have shy kittens and bold parents tend to produce bold kittens. However, kittens' personalities are by no means fixed for life. A timid kitten can become bolder as he matures, so long as he doesn't encounter anything unpleasant when he does pluck up the courage to do something brave. Conversely, a brave cat can turn into a scaredy-cat if he is mistreated, or gets hurt when he pushes his luck once too often. All experiences need to be positive for a kitten; a bad experience can be as detrimental as having no experience. Build up a kitten's experiences gradually over time, and repeat them regularly throughout the first to months of his life. 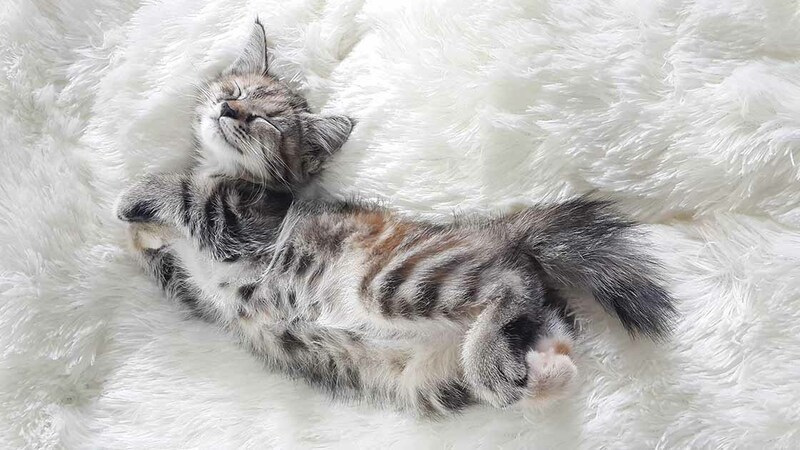 The greater the variety of positive experiences kittens have between two and eight weeks of age, the more likely they are going to be able to adapt to whatever life throws at them in the future. Many rescue centres will have their kittens placed in foster homes for this reason. Whether you've rescued or purchased a kitten, find out what socialisation he has already had so you can continue this at home. Habituating kittens to a variety of household sounds and experiences is imperative for preparing them for domestic life, and can have a lasting impact on cat welfare. Kittens who hear novel sounds, such as a vacuum cleaner, thunder, and fireworks, are much less likely to be fearful of these noises in the future. If your kitten finds the vacuum cleaner and other such noises unpleasant, do things normally - there's no need to tiptoe around. If he appears frightened don't reassure him; he has to accept it is normal. In order to get kittens used to people, research has shown that kittens need to have positive handling experiences with at least four different people. Studies have shown that as little as 40 minutes of handling a day during the socialisation period has a profound effect on the friendliness of kittens and their willingness to approach people. Invite a variety of friends to your home - ideally of different genders, heights, and hair colour - to help your kitten get used to all sorts of different people. Try to arrange for your kitten to meet some (well-behaved) children at your house. Make sure they know how to correctly handle your kitten so he doesn't become frightened. Get your kitten used to being in the car by taking him out for short trips. Offer a special treat when you return to your house, so he associates travelling with a positive reward. Kittens need to get used to being left alone, especially if you work full-time, so gradually leave him for increasing lengths of time when you are socialising him. Play is important for kittens because it increases their physical coordination, social skills and learning limits. We should never stop playing with our cats, no matter how old they are, and remember that play is about predatory behaviour. 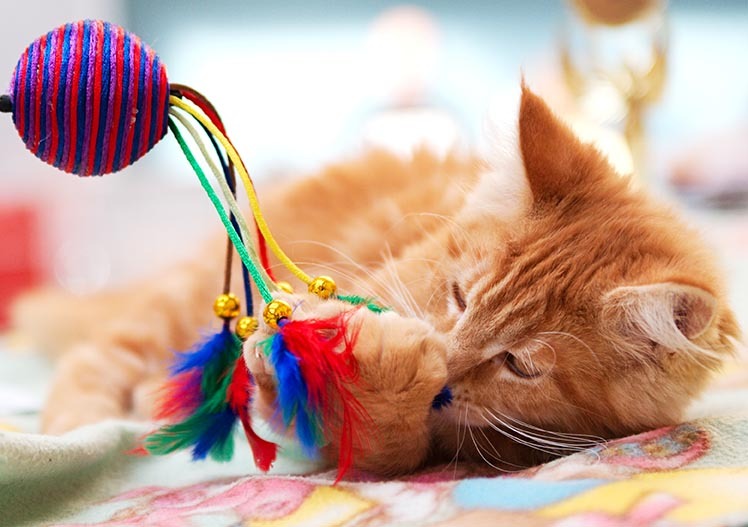 Creating a stimulating environment for your kitten and providing toys that encourage natural behaviours will help to prevent boredom, while continuing to pet and talk to your kitten will help him develop good 'people skills'. Toys don't need to be expensive to entertain your kitten and encourage good playing manners. A cardboard box with a couple of holes cut into it will provide hours of fun and you can encourage him to tap into his hunting and pouncing instincts by using a fishing rod-style toy. Playing with toys can also avert biting tendencies, play is all about hunting and chewing and it can be a rewarding sensation for a kitten to bite into flesh. The more he does it the more he will want to. Key advice is to distract your kitten with a toy as soon as he starts this type of behaviour. If he becomes too rough when playing, stop the game immediately and say 'no'. Remember, boisterous behaviour that can seem fun in a kitten can develop into problematic behaviour when the cat is fully grown. 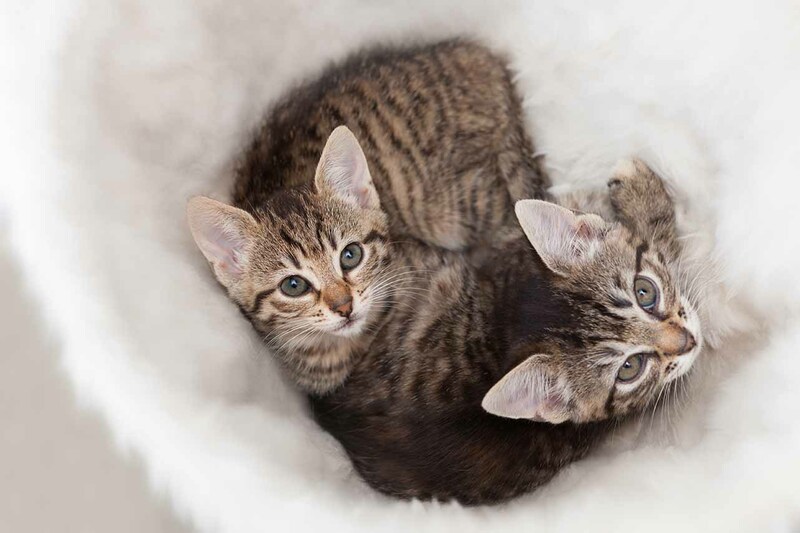 Most kittens are still at home with their mother during their socialisation period, so it is up to the owner or breeder to make sure that the kittens are well socialised. You should then continue to give your kitten lots of positive new experiences when he arrives at his new home. Most kittens are fully house-trained by mum so all you need to do is show your kitten where his litter tray is and remind him every time he wakes up and after eating. If you see him looking for an alternative corner and he begins sniffing and scratching, gently place him in the litter tray. He will soon work out what the tray is for. These early and consistent lessons in good behaviour are important to stop bad habits developing. The age at which social maturity is reached varies between individuals and can be from 18 months to four years old. This is the stage when any problems will arise, usually due to other adult cats. Even if cats have grown up together, cracks may begin to appear in their relationship. They may start to compete over territory, such as fighting over a favourite bed, and this can create stresses leading to a variety of illnesses, including urinary tract disease, or inappropriate behaviours such as marking. A cat that has had a good grounding as a youngster will be more able to cope with these difficult times. Even if it simply means that he understands that he can find his own space, and develop strategies to help him cope with a situation. Read more on how to stop your kittens fighting. While your kitten should receive a thorough examination from your vet, regular home check-ups of his ears, eyes, fur, skin and bottom will help alert you to any problems. Rewarding him with a treat when you have finished will teach your kitten to associate this experience with a positive outcome. There will also come a time when you have to take your kitten to the vet or maybe the cattery and you will have to use a cat carrier. If you don't want a disappearing kitty every time he spots it, make sure he doesn't think every appearance will result in an unpleasant experience. Leave the carrier in the house so he can rub himself against it and mark it with his scent. Tempt him inside with treats so he will learn to associate it with a reward. Good behaviour should always be rewarded, so he learns what gets him attention and nice things, and inappropriate behaviour tackled by removing the cause of it. Never smack or tell him off if he makes a mistake as he won't understand and you could be at risk of spoiling the relationship you have built up. And finally, remember sleep is essential for health, growth and development, so don't be tempted to wake him up for a cuddle. Leave him in peace!